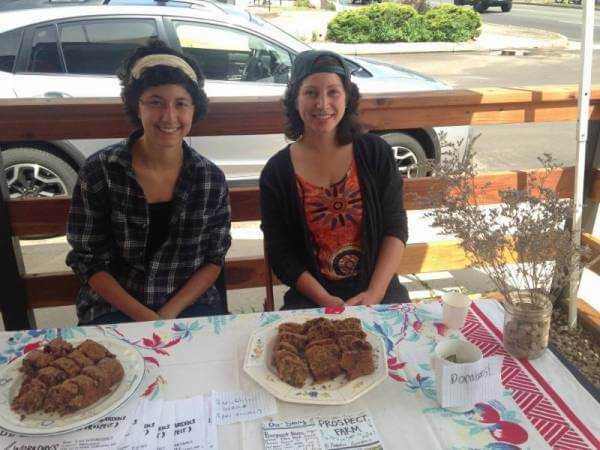 Prospect Farm, located in the same neighborhood as Ranch Foods Direct, at 3403 N. Prospect, is run by Sophie Javna and Mercedes Whitney (from left, shown above) two Colorado College alums who live on-site. Prospect Farm is the original “tiny farm” launched last year by Pikes Peak Urban Gardens’ Small Farms initiative. They also want to restore stronger links between people and their food. “We want to create a new way of selling produce online through a website that we’ll update everyday, and then we’ll make deliveries by bike,” she says. They also want to ensure the food they grow is accessible to everyone regardless of income level, so they have a work-share program and provide free lunches on volunteer workdays. They also host neighborhood potlucks during the growing season. In the weeks to come Prospect Farm will be sharing their bounty at Ranch Foods Direct’s Farm Stand Friday, including “a summer and winter squash explosion,” sweet corn, pole beans, kale, lots of heritage tomatoes and more. Produce grown just a few blocks away? You can’t get more local than that!